Singleton Court - A B Lynn & Co.
﻿﻿ Singleton Court is a purpose built development on ground and first floor levels comprising 16 completely self-contained flats in three small blocks. 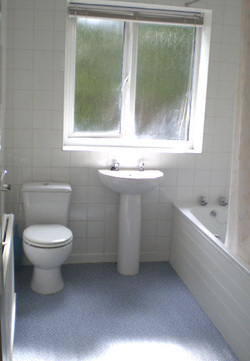 Although built during the late fifties, the complex has been newly refurbished (internally) over the last few years, incorporating brand new fully fitted kitchens and bathrooms, all of which are fully tiled. All flats have gas central heating and double glazing and are furnished to the extent of new carpets curtains, light fittings, leather lounge suites, coffee tables etc.. The very large fully fitted kitchens with dining areas include cookers and refrigerators and plumbing for washing machines, while bedrooms all have new wardrobe suites and bedside cabinets, as well as double beds. Most bathrooms have a shower as well as a bath. The common areas such as entrance hallways are carpeted and brightly lit, some being decorated with potted shrubs or floral arrangements. Every flat has the convenience of its own telephone line and a door entry system, and the development has its own private floodlit car park at the rear, shrouded by well established trees and evergreens. Garages are optionally available. The front of the development is lawned with well stocked flower beds. Rentals vary in price from £105.00 per week for a one bedroomed apartment and from £115.00 for a two bedroomed unit and are paid calendar monthly. There is also a six-monthly service of £100. These figures exclude all outgoings such as gas, electricity, water and telephone charges which the tenant pays directly to the relevant authority. Water rates are presently in the region of £400.00 p.a. and Council Tax is the lowest Band A, at £1009.00 p.a., reducing to £757.00 for single occupation. Singleton Court (M25 0FW) is situated on the border of Prestwich and Salford 7 on the periphery of Broughton Park. From Bury New Road, proceed up Singleton Road, turning left onto Bury Old Road. The first buildings on the left hand side of Bury Old Road are the three small blocks of flats, Singleton Court. The development is well serviced with a bus stop outside it and well positioned with Parkhills shopping parade next to it and is little over five minutes drive from Manchester centre. Once you have driven past this development and familiarised yourself with its location, should you wish to arrange a viewing, please do not hesitate to contact our office. (b) no person within the employment of A. B. Lynn & Company or any associate of that company has any authority to make or give any representation or warranty whatsoever, in relation to the property. Whilst the shown pictures are of flats actually within the various developments, they are not necessarily the pictures of the actual flat available at the time of enquiry. They are intended merely to give an idea of internal standards, for example, whilst some flats have laminate floors, others are carpeted.